A woman drags by a limp leg the carcass of one of her few remaining prized black-headed sheep away from her family’s domed shelter fashioned out of sticks and fabric that stands alone amid the desiccated scrubland. Across Somali Region of Ethiopia, there are 264 sites containing around 577,711 internally displaced persons (IDPs) according to a survey conducted by IOM between May and June 2017. “Once they are all dead we will go to one of the settlements,” says the Somali-Ethiopian pastoralist who is dealing with the fallout of the latest drought afflicting the Horn of Africa. Last year, Ethiopia’s highland region was affected. 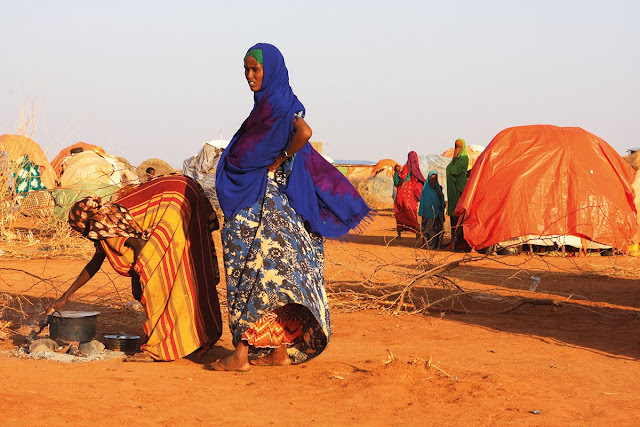 This year, the lowland Somali region in the southeast has been hit, devastating the herds of the pastoralists who live there. Across the region, whose ethnically Somali inhabitants are Ethiopian nationals, there are 264 sites containing around 577,711 internally displaced persons – also known as IDPs – according to a survey conducted by the International Organisation for Migration (IOM) between May and June 2017. But the scale of numbers means the government is overwhelmed – many sites have reported no access to food – hence international assistance is sorely needed. However, international aid is often more geared toward those who crossed international borders.